Whether you’re a well-versed wine aficionado, or simply someone ready to enjoy a nice glass with dinner on occasion, one of the keys to maintaining a proper wine collection is educating yourself on the various types and styles of wine racks available. Designed to hold anywhere from one to well over one hundred bottles, wine racks are not only functional in helping to keep the wine stored properly to mantain its peak characteristics, but wine racks are also often quite beautiful, adding a touch of elegance, class, or simply a bit of whimsy to any room in which they are placed. From small to large, wood to metal, affordable to expensive, wine racks are versatile creations that can take your kitchen or dining room, as well as your wine collection, up to the next level. The basic function of a wine rack was originally to simply keep the wine bottle stored at the proper angle to ensure the cork was completely covered in wine, preventing it from drying out. A dry cork will not only affect the oxygen balance within the wine bottle which inhibits the aging process and potentially spoils the wine, it could also begin to crack, leaving small cork fragments in the wine itself. The slight angle to a wine rack ensured that the cork would remain solid and saturated. Wine racks also provided easy access to the various bottles to allow the owners to rotate the bottles, as needed, as well as clearly view the various vintages and labels when selecting a wine to consume. What Styles Of Wine Racks Are There? 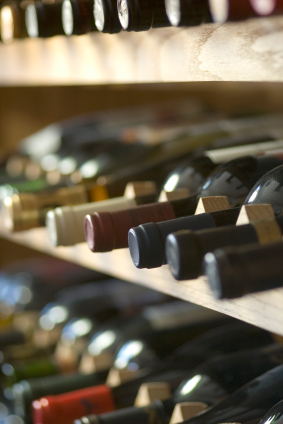 There are four primary styles that wine racks tend to fall into. These are modern design, traditional, antique, and novelty. Each category bears a specific look and tends to appeal to a select group. Modern wine racks are, by far, the boldest designs on the market today. Known for their unique shapes, bold colors, and unusual materials, they are not always intended for the faint of heart. Modern wine racks allow wine lovers to display their collections in a highly artistic fashion, creating bold statements and becoming focal points of any room. Traditional wine rack designs tend to be somewhat simplistic in nature, possessing the added functionality of modern design with the more subdued nature of antique styles. While not as ornate or decorative as some antique wine racks available, they do tend to convey a sense of elegance and sophistication using a somewhat understated, yet clean design. Traditional wine racks aren’t necessarily designed to be noticed, instead, they are intended to blend in well with their surroundings. Antique wine racks are the most impressive examples of the artistry and craftsmanship that can go into a wine storage unit. Often crafted to resemble fine pieces of furniture rather than simple storage units, antique wine racks remain popular for their intricate details and ornate designs. They are also highly valued for their workmanship and durability, lending to the fact that there are such a large number of true vintage and antique pieces still seen in active use today. While these tend to fall closer to the modern wine rack design styles, novelty wine racks are, simply put, a fun and whimsical method of storing wine. They are not intended to necessarily be as practical as the other designs, often relying more on visual appeal than anything else. Typically seen most frequently in single bottle designs, novelty wine racks are intended as a means to express individual interests or complement specific décor themes. What Types Of Wine Racks Are There? There are numerous types of wine racks available to suit a wide range of storage needs. Single bottle wine holders may not technically be considered a wine rack, but most people include them in this category anyway. While the majority of novelty designs are single bottle styles, they are available in a wide selection of more elegant and upscale designs as well. Single bottle holders are often used at the dining table to hold the particular bottle being served that evening. They can also be used in the kitchen to hold a bottle of wine frequently used for cooking purposes. Table top and counter top wine racks tend to be somewhat similar in design, with a few differentiating features that set them apart from one another. Table top wine racks are typically more ornate in design, intended to be used as a centerpiece at the dinner table, while counter top wine racks will often bend in with their surroundings, focusing more on function than form. Both styles will often hold anywhere from three to five bottles of wine. For wine lovers who are looking for wine storage options that are able to grow along with their collection, stacking and modular wine racks are very popular. Stacking wine racks are often made to hold anywhere from five to ten bottles across, allowing additional units to be placed above, as needed, to accommodate additional storage needs. Modular units offer the same method of increased capacity, but often rely on side by side placement in addition to vertical expansion. The storage capacity of modular units can vary from six bottles to upwards of 120 bottles. For a more mobile option, there are a variety of wine carts available. Generally intended for use at social gatherings or larger parties, the cart will typically be used to serve hors d’oeuvres or carry wine glasses on the upper surface, while storing wine bottles on the lower portion. They can also be used simply for decorative purposes, creating a unique visual appeal. For a more space saving option, wall mount wine racks are the ideal solution for bringing wine storage up off the floors, tables, and counters. Holding anywhere from five to ten bottles or more, wall mount racks come in a variety of designs, frequently found in both horizontal or vertical placements. The majority of antique wine racks were created in the bakers rack style. This large storage unit featured shelving on the upper portion, often incorporating a wine glass holder of sorts, and wine bottle storage on the lower portion. They were designed to be visual focal point sin the room, often made from wrought iron and bearing very ornate detailing. Ranging from compact units to larger designs, cabinet styles wine racks are probably the most common style seen today. Made in either an open air design, as typically seen with metal racks, or a closed styles, found with wood structures, the cabinet design was essentially a wine rack with a decorative door. Closed styles are particularly popular today as they help to protect wine collections from exposure to dust and other potentially damaging particulates in the air. I’m interested in purchasing this domain. How much would it cost? This is Max Li from a manufacture specializing in producing racks in China.